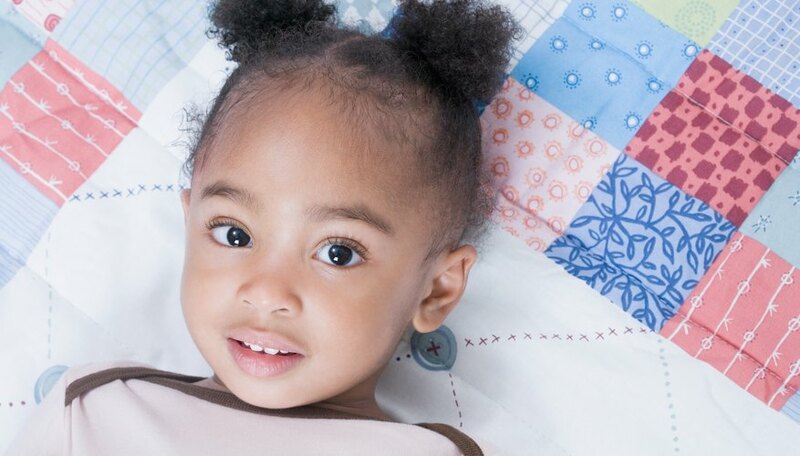 For the beginner quilter, making a crib-size baby quilt can be a rewarding first project. Since the finished product will be a cherished keepsake, the motivation to persevere is built in. The smaller size also makes it manageable — crib quilts are generally about 36 by 54 inches. Making a quilt involves piecing the top; quilting the top, the batting and the backing together, and then binding the edge to finish it. Prepare the fabric by washing, drying and pressing it. This will preshrink the fabric and keep the dyes from running when the finished quilt is washed. Cut 40 squares, 6.5 by 6.5 inches. Sew the squares into eight rows of five. Use a quarter-inch seam allowance. Press each seam toward the darker fabric. Sew each of the eight rows together. Press these seams all in the same direction. Cut two strips of fabric, 3.5 by 48.5 inches, for the vertical borders. Sew one to each of the longer sides of the quilt. Press the seams toward the border. Cut two strips of fabric, 3.5 by 36.5 inches, for the horizontal borders. Sew one to each of the shorter sides of the quilt. Press the seams toward the border. Cut the fabric for the back of the quilt, 36 by 54 inches. Make a sandwich by laying the backing right side down, then the batting and then the pieced quilt top right side up. Smooth out each layer as you go so there are no wrinkles or puckers. Baste the three layers together either with thread or with safety pins. Start in the middle and move out toward the edges to keep the layers from shifting as you quilt. Quilt the layers by tying them together with yarn or by quilting. If you tie the quilt, use the needle and yarn to tie all three layers together in the center of each square. Otherwise, proceed to Step 6. To quilt the layers together, stitch all three layers together with the quilting thread. Use any design, but stitching diagonal lines through the center of each block to make an "X" is one of the easiest designs. Prepare the quilt for finishing by trimming the edges of the top, batting and back so they are all even and flush with each other. Cut bias strips of fabric 3 inches wide and sew the strips together to a length of at least 190 inches to make the binding. Attach the binding to the quilt front on the bottom side starting about 4 inches in from one corner. Stitch the binding to the entire perimeter of the front of the quilt. Trim the excess binding so there is a 3-inch tail. Turn the binding over the edge of the quilt and begin stitching it to the quilt back with a whip stitch. Once you’ve stitched the entire perimeter to the quilt back, tuck the 3-inch tail into the starting point and sew the opening closed.